Union Mills, July 24, 1861. SIR: In conformity with Special Orders, No. 145, headquarters Army of the Potomac, I have the honor to report that upon the morning of July 21, 1861, I first received orders to hold myself in readiness to advance at a moment's notice. I next received a copy of an order sent to General Jones and furnished me by him, in which it was stated I had been ordered at once to proceed to his support. 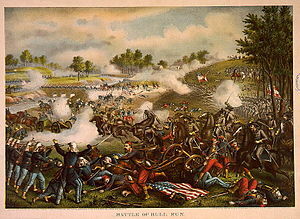 I immediately commenced crossing my brigade over Bull Run, but whilst so doing received an order to fall back to my former position, which I did, and a short time afterwards received another order, brought by Colonel Terry, aide-de-camp, to cross again, proceed up the run, and attack a battery of the enemy upon its flank and rear, regulating my movements upon the brigades of Generals Jones and Longstreet. I again crossed the stream, and had proceeded about a mile and a half in execution of the order when I was stopped by an order to march at once to stone bridge, following General Holmes' brigade, which had already been ordered to proceed to that point. I deem it proper to state that the courier said he had been accompanied by all aide-de-camp whose horse had given out before reaching me. I countermarched and marched at once to headquarters in the field, remained in reserve at that point until ordered back to Union Mills, which I reached after a long and fatiguing march the same night. 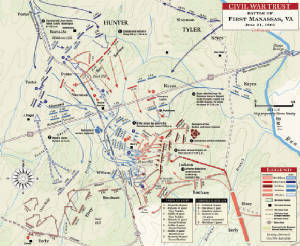 My brigade consisted of Rodes' Fifth Alabama, Seibels' Sixth Alabama, Seymour's Sixth Louisiana, a battery under Captain Rosser, the Washington Artillery, and four companies of cavalry, under Lieutenant-Colonel Jenifer. The infantry would hardly have got back that night, but for the excitement of hearing that the enemy were in possession of the ford. As connected with this, I send a report of a skirmish on the 17th, of Colonel Rodes' regiment becoming engaged and checking the enemy, owing to the non-reception of the order to fall back on their appearance.